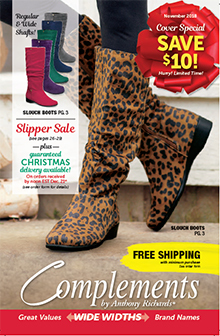 Save more on the brands you love featuring discount womens shoes and affordable mens styles from Complements, part of the AmeriMark family of catalogs. Free Shipping will be applied automatically at checkout on the Complements website. Athletic - Walk, exercise, and run errands in comfort with a versatile range of athletic shoes designed for the woman on the go. You'll find a sporty selection of lace up, velcro and slip on sneaker styles from popular brands including Keds, Easy Spirit, Skechers, Hush Puppies, Grasshoppers, and more. Stay on budget with affordable shoes for women that are built for comfort and designed to last. Boots - Keep feet warm, dry and on trend with a bargain selection of womens boots that will make you look forward to the fall and winter months. Shop a chic selection of knee high boots and ankle booties, flat boots or heeled styles, with plenty of casual, dress, and weather specific styles to choose from. You'll find fashion forward designs as well as waterproof, stain resistant, cushioned and winter-ready styles including convenient store in your purse drizzle boots that will keep your regular shoes dry and protected from the rain. Casual - From wear everywhere flats to roomy oxfords, mules and clogs to stretchy slip-ons, Complements has all of your casual footwear needs covered, with discount womens shoes that will keep your feet housed in comfort around the house, at work, and all weekend long. Enjoy basic flats, colorful sandals, slides and thongs for day, or cozy up in a pair of cute and comfy slippers with heated and cushioned styles that are perfect for morning and/or bedtime. Dress - Get all dolled up with fashionable dress flats or heels available in a wide range of colors to match any outfit. Shop by brand, color, size, width or style, from dozens of stylish pumps, slingbacks and special occasion shoes from all of your favorite comfort brands. You'll also find a collection of handy accessories including wooden shoe stretchers to ensure a better fit and space saving organizers that will keep your special occasion and seasonal styles stored safely under the bed. Mens - In addition to their wide selection of affordable shoes for women, Complements also features a comfortable collection of casual footwear for men including walking shoes, sneakers and sandals, rugged slip-ons and clogs, loafers and lace ups, boots and slippers, from celebrated brands like Hush Puppies and Dr. Scholl's. The Complements catalog helps make shoe shopping a guilt-free experience, giving you access to hundreds of womens shoes available in your favorite styles from all of your favorite brands.